The historical and cultural center of the Mullerthal Region - Luxembourg's Little Switzerland as well as the oldest city of Luxembourg (5.600 inhabitants) has retained its medieval ambience: labyrinthine streets, remains and towers of the ancient city wall and a marketplace with a Gothic town house take the visitor back in time. In the center there is a museum of prehistory and at the lake there are the remains of the largest Roman villa north of the Alps, along with a visitor center and a permanent exhibition. 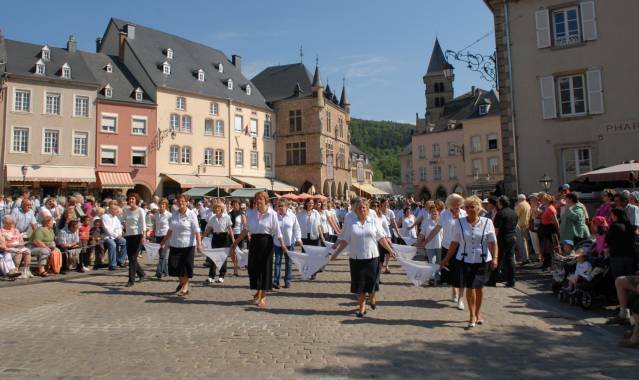 The city of Echternach also has a wide cultural offer with a large calendar of events during the summer months: concerts such as the International Festival of Echternach with classic music in May and June, its Jazz concerts in September, folklore festivals and flea markets provide a lively atmosphere. 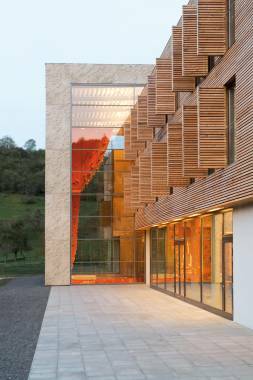 The Trifolion is a generously designed cultural and congress center with a sophisticated program. A large recreational area with lake, bike and hike trails and an adventure playground make a holiday here worthwhile. 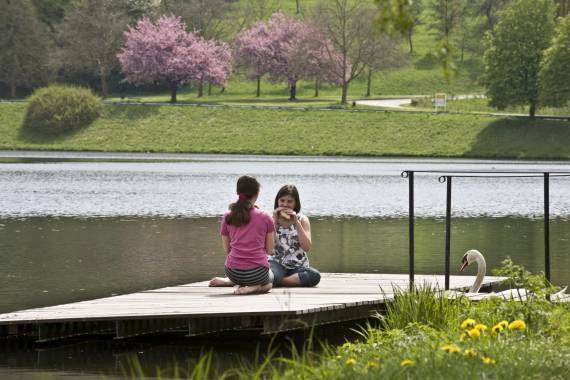 In addition to hotels and restaurants, there are two campsites and a modern youth hostel situated next to the lake. EDEN: European Destination of Excellence. 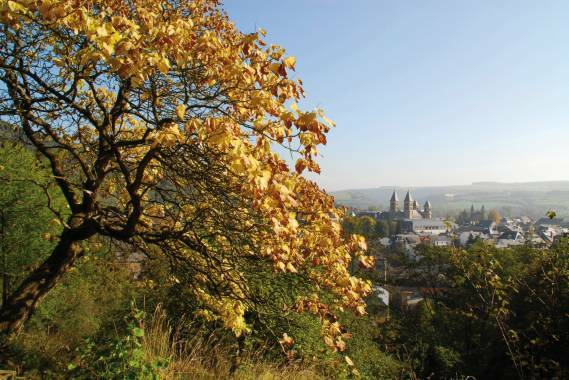 Echternach was rewarded with this EU- award because of its quality in the field of sustainable tourism. The origins of the town wall go back to the 10th century. In the 13th century, the wall was enlarged and contained 20 towers and gates. Five towers had been preserved and restored. Two medieval towers can be rented as a holiday flats and are available at the local tourist office. If you visit the town, you should not miss the Gothic house, even if it was rebuilt true to the original in 2000. One of the rare witnesses from the medieval city fell into parts in 1996 and caused significant damage to the window frames. Equally interesting is the cross of justice on the marketplace which represents the sovereignty of the abbots over the city bourgeoisie. 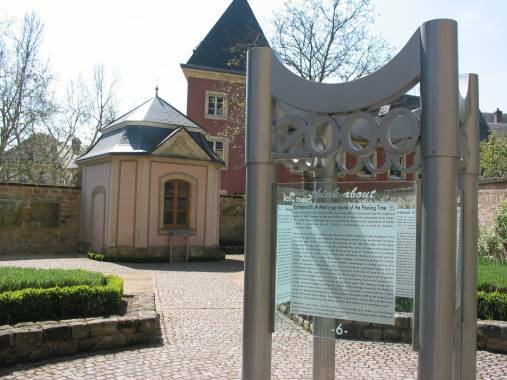 In 1774, the inhabitants of Echternach wanted to tear down this medieval monument and replace it by a fountain. But only 20 years later, it was destroyed by the French revolutionary troops. Rebuilt in 1938, it was destroyed during World War II in 1944. In 1982, it was erected again according to 18th century plans. 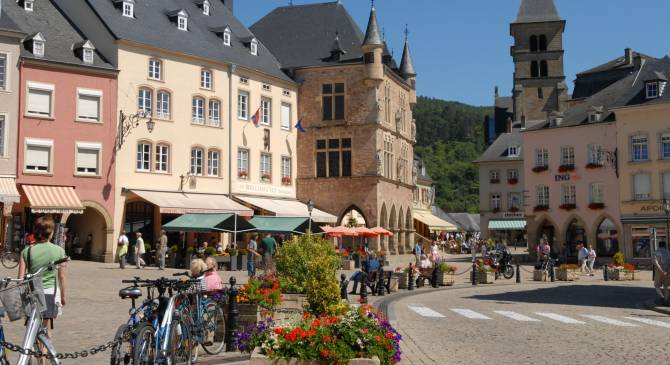 The former courthouse “Denzelt” belongs to the main attractions of Echternach. Some parts of the building go back to the 14th century. The reconstruction of the court after a fire in 1444 largely gave the building its present appearance and Gothic and Renaissance elements mingle on the facade. During the restoration in 1898, the statues of Virgin Mary, King Salomon and the four cardinal virtues were added. 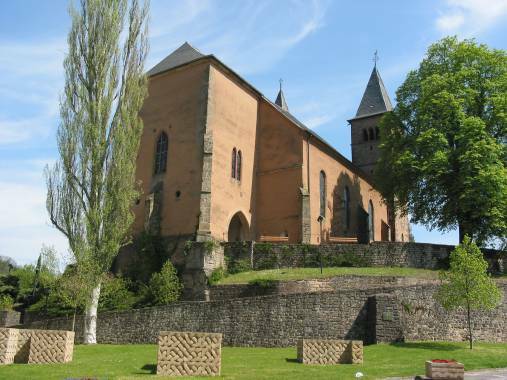 At the foot of the church dedicated to the Apostles Peter and Paul, a stone sculpture provided with the Celtic interlace reminds of 1300 years history of Echternach. The St. Peter and Paul church is located on a Gallo-Roman archaeological site. 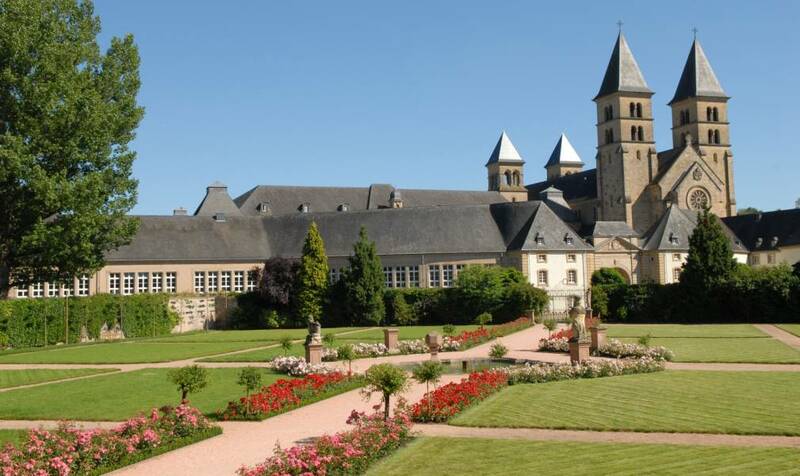 During the Merovingian period, it served as a small hospice and two chapels, which were donated as a gift to Willibrord, in 698, by the Abbess Irmina of Oeren near Trier. In the 10th and 12th century, a three-nave church was built and equipped with Gothic elements in 1480. The frescoed church was rebuilt and restored several times. The building of the HIHOF houses the interesting museum of prehistory. The origins of the house are unknown. The cellar leads back to the 15th century and the façade displays Gothic elements. The building served for a long time as farm building of the hospice, as ceramic studio and as secondary school during the 19th century. The Roman villa (118 x 62 m) that had been built between the 1st and 5th century is one of the largest villas north of the Alps. It was rediscovered in 1975 during excavation works for the recreational lake in the “Schwarzuecht”. The INFOFORUM houses a thematic museum on the life of the Romans. In front of it is the former residential part of the villa (pars urbana), just behind are the outbuildings of the old villa (pars rustica), which are only partially excavated. The INFOFORUM depicts scenes of everyday life of the Romans; associated literature is available in the small museum shop. Model reconstructions and 3D displays as well as a visit to the excavation site show the Hypocaustus, sauna, pool facilities and a reception hall. In the Roman garden, Hortus AMOENUS, plants are grown going back to Roman times. In the AUDITORIUM musica et vox, music is played, poetry and speeches of the antiquity are proclaimed. 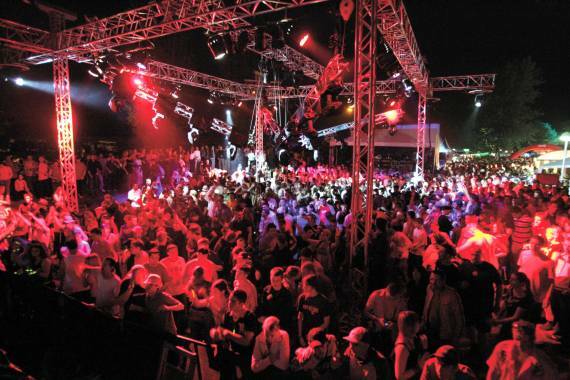 Conferences and group activities can be also be held here.